All great solos have their roots in scales. A solid grounding across the keys - knowing your Harmonic Minor from your Melodic, understanding the diffference between a Pentatonic Major or Minor scale - with practice for good muscle memory will make your guitar sing like a guitar hero's! With notation and TAB. 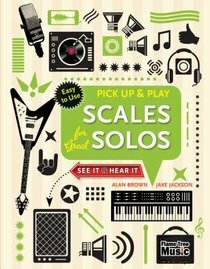 About "Paup: Scales For Great Solos (Pick Up And Play Series)"
Jake Jackson's publications, as writer, editor or contributor, include "The Beginner's Guide to Reading Music," "How to Play Classic Riffs" and "Play Flamenco." As guitarist and songwriter he has been in a few bands, including Slice, The Harmonics and Starbank and has studied a form of Flamenco guitar. Although Jake has a range of fine guitars in his house his favourite music software is Sibelius and, having worked with Cubase for many years, is now moving over to Logic Pro.